I have few things in common with Rebekah Brooks beyond the fact that we’re both women and both in the media (ish – it’s not like she’s gone into Engineering or anything since quitting the Day Job). But now it turns out we have two other things in common – we’re both horsewomen, and we’ve both been offered the gift of all creatures great and small by Plod. When the revelation exploded on Twitter today, courtesy of the Leveson Inquiry, that Rebekah Brooks had been loaned a police horse by the Metropolitan Police, it was truly astonishing. I was reading the latest evidence regarding murdered Private Detective Daniel Morgan, a case I know from my South Wales Argus days and more lately through Media Wales, when Horsegate broke, and I can understand the outpouring of rage, disbelief and – inevitably – humour that followed. But people in glass houses shouldn’t throw stones. I too had the prospect of animal husbandry dangled before me by Her Majesty’s Finest, although it wasn’t quite a quarter tonne of horseflesh; it was a cockerel. 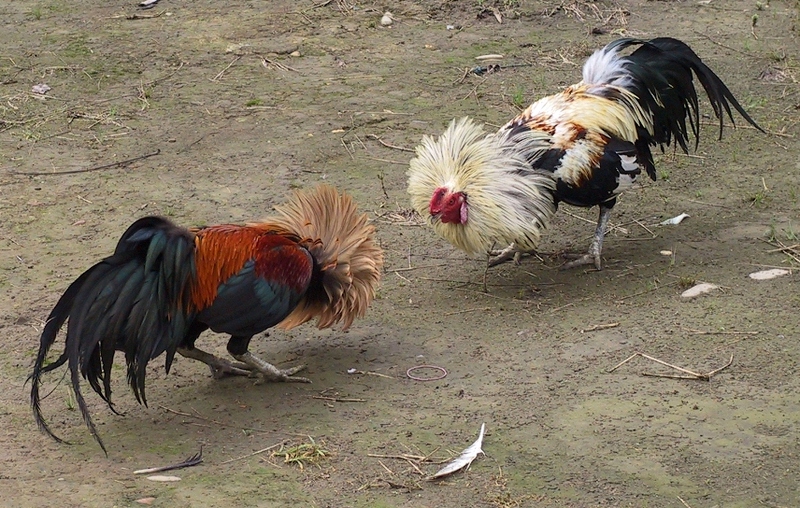 A fighting cockerel that was taken into custody – along with its sparring partner – by Pembroke Dock Constabulary, acting on a tip off that illegal bird fighting was happening at Catshole Quarry. Given that more than two decades have now passed, and everyone involved has retired, I can’t imagine there’s too much at stake to say that my morning trip to the local nick to go through the crime book was disturbed by much ruckus from the back yard, home to the police cars and seized dog pens. Walking round I met the then-licensing officer (a character I knew from court and council, and who had boomeranged between sergeant and constable at least twice) bent double wheezing with laughter while two constables attempted to separate a couple of shrieking cockerels who were busy clawing ten bells of crap out of each other. Eventually I learned the birds had been confiscated the previous night, kept in separate cat transporter boxes and then, with morning, the idea of putting them in a dog pen occurred. Unfortunately, they were put in the same dog pen and did what fighting chickens (which are essentially Velociraptors with feathers and a smaller brain) do best, until the nearest junior ranking staff were sent in to restore order. Once the birds were in different pens the problem of long-term care emerged. As I was still involved in the discussion (this happens on regional papers – you find yourself sucked in to the weirdest situations) and was known to be of Farming Stock, I was asked whether I’d be interesting in caring for them til something more permanent could be worked out. I assume that meant an RSPCA rehoming but, equally, it could have meant until a special occasion meriting a roast fowl, say a really good drugs bust, presented itself. As there was no way I was taking in a psychotic rooster or two I declined, but volunteered a farming friend who lived a few miles away. He had large pens to keep the birds apart or, failing that, shotguns and a pragmatic approach to life and death. And that was that – the birds were taken into foster care and housed on separate farms owned by the same family. Their fostering never ended, and they had a free range life that was probably longer than the average chicken’s due to their self-defence abilities. I think the RSPCA did prosecute but as I didn’t cover the case there is no satisfactory judicial outcome to report.